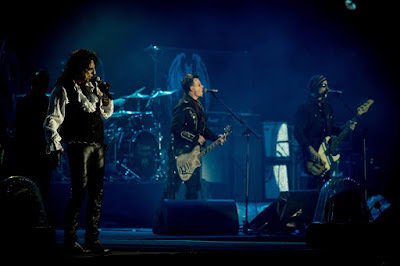 Supergroup The Hollywood Vampires headlined at Rock In Rio in Lisbon, Portugal on May 27 and video from the show is available. The band topped a bill at the event’s second weekend alongside Korn and Rival Sons, delivering a 21-song set that featured 3 originals and 18 covers of classic rock tracks by David Bowie, The Who, T. Rex, The Doors and Led Zeppelin, among others. Led by the trio of Alice Cooper, Johnny Depp and Aerosmith’s Joe Perry, the summer 2016 shows see Robert DeLeo of Stone Temple Pilots step in on bass for Guns N’ Roses Duff McKagan due to his other commitements, and is rounded out by drummer Matt Sorum, guitarist Tommy Henriksen and multi-instrumentalist Bruce Witkin on piano, percussion and guitar. "Here is a gang of friends who came together really by chance and over the last year we were finally able to wrangle our schedules and the energy just fell into place,” says Perry. “Playing with this line up is like a dream come true. After seeing the reaction at Brazil's Rock In Rio 2015 in front of 100,000 fans, I know this band is going to tear the house down. Hell, I would want to be in the audience to see us rip it up." Cooper recently confirmed that The Hollywood Vampires have begun working on a follow-up to their 2015 self-titled debut, which featured a collection of covers of tracks by classic rock acts.